In a milestone decision, the Food and Drug Administration (FDA) has approved for the first time a medication derived from the cannabis plant. EpidiolexTM, an oral solution of cannabidiol (CBD) developed by GW Pharmaceuticals in the UK, has been approved for the treatment of two rare seizure disorders, Dravet syndrome and Lennox-Gastaut syndrome. It is the first FDA-approved treatment for Dravet syndrome. Analysts predict Epidiolex TM will cost $2,500 to $5,000 per month. Other cannabinoids produced synthetically in laboratories are currently available, but the FDA has previously blocked medicines derived from the cannabis plant. Marinol (dronabinol), a synthetic THC capsule, was approved by the FDA in 1985 for the treatment of nausea and vomiting associated with cancer chemotherapy. Requests by pharmaceutical companies to produce generic versions from plant material have been rebuffed by the FDA, even though it would lower the cost dramatically. Even generic dronabinol is about 10 times more expensive than comparable, commercially available cannabis-based products. FDA approved medications can be prescribed by doctors, purchased in pharmacies, and typically covered by insurance. Patients who obtain medical cannabis through state programs must buy it from dispensaries or, if permitted, grow their own. Health insurance will not cover medical cannabis, though workers compensation insurance has in some cases. While other clinical trials and pre-clinical studies of CBD confirm patient reports that it can be effective for a broad range of conditions, including other seizure disorders, EpidiolexTM has only been approved for the two rare pediatric seizure conditions. Estimates of the incidence of Dravet syndrome range from 1 out of 15,700 to 1 out of 40,000 infants, while Lennox-Gastaut syndrome accounts for just 1-4 percent of childhood epilepsy cases. CBD remains a Schedule I substance, and all CBD products other than EpidiolexTM remain federally illegal. To be prescribed, it will be placed in a different schedule that recognizes medical use. 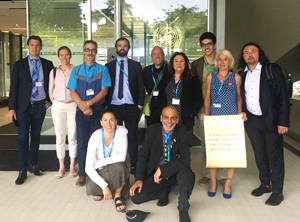 In June, Americans for Safe Access and other members of the International Medical Cannabis Patients Coalition (IMCPC) testified at the 40th meeting of the World Health Organization's (WHO) Expert Committee on Drug Dependence (ECDD) in Geneva, Switzerland. The ECDD is assessing the international classification of cannabis in light of its medical uses and potential harms. Members of ASA and IMCPC produced and delivered four reports with references and recommendations on the cannabis plant and cannabis resin, extracts and tinctures of cannabis, cannabidiol (CBD) and delta-9-tetrahydrocannabinol (THC). International bodies have been calling on the WHO to address the scheduling of cannabis for almost a decade. In 2009, the Commission on Narcotic Drugs requested an updated review by ECDD. In 2013, the International Narcotics Control Board asked WHO to evaluate “the potential medical utility of cannabis and the extent to which cannabis poses dangers to human health.” Cannabis is currently scheduled in Schedules I and IV of the Single Convention on Narcotic Drugs as amended by the 1972 Protocol (the “Single Convention”). Advocates filed a Critical Review and three Pre-Review in response to the ECDD technical documents, which outline the medical efficacy, toxicology, and epidemiology of various preparations of cannabis (WHO reports can be downloaded here). Patient advocacy groups at the meeting from Argentina, Mexico, Uruguay, France, Germany, New Zealand, the Netherlands, South Africa, and the United States all recommended changes in the international scheduling of cannabis and medical products made from it. IMCPC’s UNGASS 2016 Declaration to the UN Commission on Narcotic Drugs, March 2015. A new bipartisan, bicameral federal bill was introduced in June that would empower states to determine their own cannabis policies. The Strengthening the Tenth Amendment Through Entrusting States Act (STATES Act) was introduced in the US Senate by Elizabeth Warren (D-MA) and Cory Gardner (R-CO) and in the House by David Joyce (R-OH) and Earl Blumenauer (D-OR). If enacted, the STATES Act allows each state, the District of Columbia, Guam, and Puerto Rico, as well as several tribal governments, to develop cannabis access programs without interference from the Department of Justice or other federal agencies. While the bill would not legalize cannabis at the federal level, it would resolve many of the federal tax and banking issues that have hindered the industry. While recent data from the U.S. Sentencing Commission shows that federal prosecutions of cannabis-related offenses have declined sharply since 2013, when Congress placed the first of five successive annual budget restrictions on Department of Justice interference, federal prohibition, the STATES Act would create an enduring solution to the federal-state conflict. "Outdated federal marijuana laws have perpetuated our broken criminal justice system, created barriers to research, and hindered economic development," said Senator Warren in announcing the bill. "States like Massachusetts have put a lot of work into implementing common sense marijuana regulations - and they have the right to enforce their own marijuana policies. The federal government needs to get out of the business of outlawing marijuana." "The federal government is closing its eyes and plugging its ears while 46 states have acted," said Senator Gardner. "The bipartisan STATES Act fixes this problem once and for all by taking a states' rights approach to the legal marijuana question." At the end of June, Oklahoma became the 30th state to enact a comprehensive medical cannabis program when voters approved State Question 788 by 56.8% to 43.2%. Oklahoma Governor Mary Fallin made the decision to put the measure on the June primary ballot, when voters typically are older and more conservative than in the general election. The medical cannabis measure attracted almost 41,000 more total votes than all candidates for governor combined, indicating many voters turned out just to cast a ballot for safe access. The initiative reflects a number of patient-focused principals from ASA’s model legislation, including strong civil protections, reasonable possession amounts, and a right to personal cultivation. And it specifies no conditions, as all other states do. “Question 788 is a tremendous victory for patient access to medical cannabis that puts responsibility for treatment decisions where it belongs, between patients and their physicians,” said ASA’s Steph Sherer. Voters in Utah and Missouri will also consider medical cannabis initiatives in November. After initially promising to call a special legislative session to write regulations for the medical cannabis program, Governor Fallin has put rule development in the hands of the new Oklahoma Medical Marijuana Authority (OMMA) within the state Department of Health that was created by the initiative. Emergency rules governing the OMMA will be considered by the state Board of Health at their July 10 meeting. Application information and requirements will be available by July 26 for all of the defined categories, and OMMA will begin accepting applications no later than August 25. For Christy Zartler, the breaking point came four years ago when her 14-year-old daughter’s neurologist announced that he’d exhausted all the pharmaceutical treatments available. For ten years, Christy and her husband Mark had been struggling to control Kara’s severe autism with conventional medications, but all the benzodiazepines and antipsychotic medications the doctors had tried had failed to stop her self-injuring behaviors. She was rendered near catatonic by the medications but still hit herself in the face as many as 3,000 times each day, at times breaking bones and inflicting injuries on anyone who tried to restrain her. Yet Christy and Mark knew there was an alternative that did work for Kara. It was just illegal in their state of Texas. 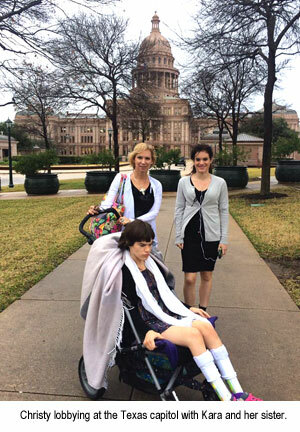 So off Christy went to Austin to lobby lawmakers for a medical cannabis law. Four years before, thanks to the intervention of a Good Samaritan neighbor who offered a medicated cookie, they had discovered that cannabis could stop Kara’s self-injuring behaviors. Since then, they had been quietly using it as an intervention when her fits grew bad. Now, with Kara’s neurologist admitting defeat, they had decided it was time to more fully integrate cannabis into her care. And it was also time to try to change the law in Texas. 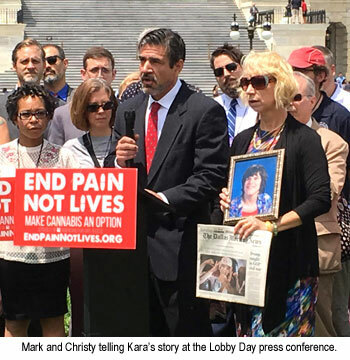 When Christy got to the capitol and looked around the room filled with 50 other activists, she saw not just patients of every type but other parents. “I thought, we’ve got moms here. We’re going to get this done right now. I was wrong,” Christy says. Trip after trip to Austin to talk to lawmakers took time and money, but the Zartlers were determined to make a difference for their family and others like them. If anyone asked Christy, who is a nurse practitioner, if they were giving Kara cannabis, she told the truth. They were, and it worked 100 percent of the time. The same was true in their community. Kara does not speak but goes to school, and her teacher and the school nurse noticed big changes in her as soon as the cannabis treatment started and asked what had changed. The Zartlers told them, just as they shared their decisions with Kara’s pediatrician, neurologist, and physical therapist. Each of these professionals was under legal obligation to report the Zartlers to the authorities, but none did. “Kara’s condition is so severe, and the benefits are so dramatic, no one really questions what we’re doing,” says Christy. Then in February 2017, with a promising medical cannabis bill pending in the state Senate, Mark went very public. He videotaped one of Kara’s self-hitting fits and his intervention: a cannabis vapor-filled bag administered through a medical mask. In the video he posted to his facebook page, almost immediately Kara stops hurting herself and visibly relaxes. Within hours it went viral, producing a torrent of attention. A local news station saw it and contacted them to do a story, then two more and the Dallas Morning News. After seeing the video, a representative from south Texas immediately introduced in the state House a companion medical cannabis bill to one pending in the Senate. Within 48 hours, Mark had to move the video to a new page for Kara and enlist the help of local patient advocates to field the deluge of messages from other parents and patients. Then came the knock from Child Protective Services. Under Texas law, giving an illegal drug to a minor is classified as child abuse, and CPS had reason to believe Mark was abusing his daughter. Ultimately, the investigation was resolved, perhaps largely, Christy says, because Kara’s case is so challenging CPS didn’t want to take responsibility for the risks of caring her. Biting can be a consequence of restraining her, and because Kara also has cerebral palsy, if her teeth lock down it can do real damage. A bite to Christy’s hand before they started the cannabis treatment had sent her to the hospital with a cellulitis infection that nearly resulted in amputation. Kara turned 18 last November, and this March, the Zartlers had to go to court for a guardianship hearing. They knew the cannabis therapy would be an issue, so they reached out to the reporter for the Dallas Morning News who had written about their predicament before. Her article about the hearing dominated the front page of the paper. 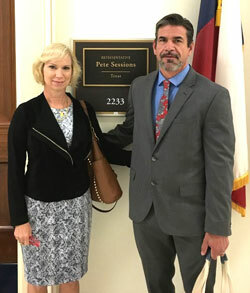 In May, the Zartlers traveled to Washington, D.C. for ASA’s National Unity Conference and Lobby Day meetings they had scheduled with their Congressional representatives, including Representative Pete Sessions. 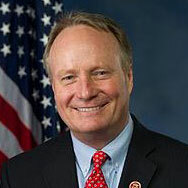 As chair of the Rules Committee, Rep. Sessions has actively blocked votes on many critical cannabis bills and amendments, including the DOJ spending rider that protects participants in state medical cannabis programs, so the Zartlers were eager to meet with him. Christy had called weeks ahead to make the appointment and reconfirmed twice that they’d be meeting in person. But when they arrived at his office, he was nowhere to be found. Christy posted a message of their disappointment on Kara’s facebook page and thought little more about it. Within minutes, the phones in Rep. Session’s office were ringing with the first of what would be hundreds of phone calls from concerned citizens. The Saturday morning after their return home to Dallas, Christy Zartler answered the phone to discover Rep. Sessions personally calling to arrange a meeting. The Zartlers recognize the power of public advocacy and are courageously sharing their family’s story with the world, despite the lack of legal protections in Texas. They have sent letters to Presidents Obama and Trump, and to Michelle Obama when she was First Lady, urging action. But they understand the risk. But by being public, they have also been able to attract support and share it with others. Now that Kara is using cannabis consistently, she has weaned off most pharmaceutical medications and has had profound cognitive improvements. She no longer needs diapers and has begun to assert herself. “She is a person now. She has a personality with needs and wants,” says Christy, who is more determined than ever to spread the word. The family’s videos on facebook and youtube have reached an even wider audience, with hundreds of millions of viewers who have seen for themselves what this plant can do for desperate cases such as Kara’s. “Cannabis can make miracles,” Christy says. Contact your Congressional representatives today to urge them to support new legislation in the House and Senate to resolve the medical cannabis conflict. The STATES Act (S. 3032/H.R.6043) would put cannabis policy where it belongs, with the individual states rather than with the federal government. The STATES Act does not make medical cannabis legal federally but allows states to set their own policies for patients without federal interference. Take action today at https://www.safeaccessnow.org/pass_the_states_act.